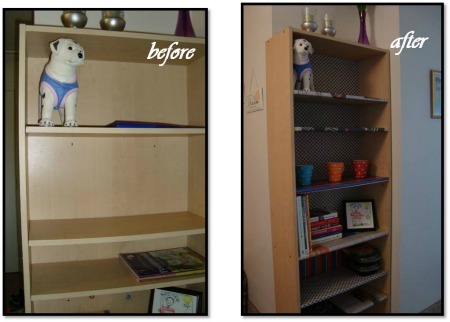 Try this DIY Bookcase for fun and easy furniture makeover ideas. My friend was moving to a new city and wanted to get rid of a tall bookshelf she had had for-like-ever (her description). She was just about ready to dump it out when she asked me if I would be interested in taking it. 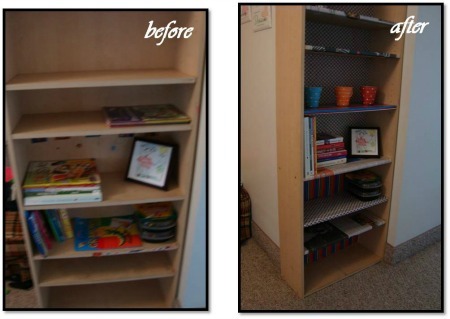 As a mother of 2 school going kids, I am always happy for some extra home storage solutions and this tall bookcase offered me not 1 not 2 but 7 shelves to organize books of all shapes and sizes. Yipee! I just had to keep it. Besides, what better place to finally start honing my diy decorating skills than a diy bookcase? Here is a look of the ‘before’. After reading and admiring so many bloggers, I remembered to take the ‘before’ pictures too. Furniture makeover is my soft spot. The thought of not having to settle for whatever is out there and to be able to personalize such big ticket items, just makes me giddy with excitement. As you can see from the beautiful frame in which I have set my 'after' photo; I am absolutely loving it. And it was super easy to do. The paper at the back is gift wrap paper. I chose a sober color and was planning to do the entire bookcase in the same paper, but then I discovered the colorful striped gift wrap paper and at the last minute, I decided to do the lower half in a different color scheme. Can you make out the difference in the picture? 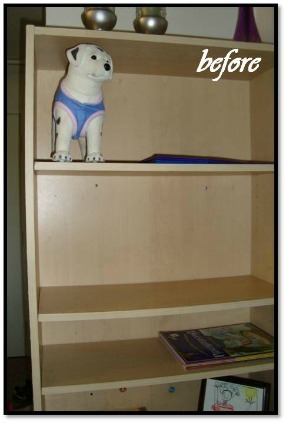 It also helps to demarcate the kids book shelf area from ours. The lower half is easy for the kids to reach and so the colorful paper is apt there. 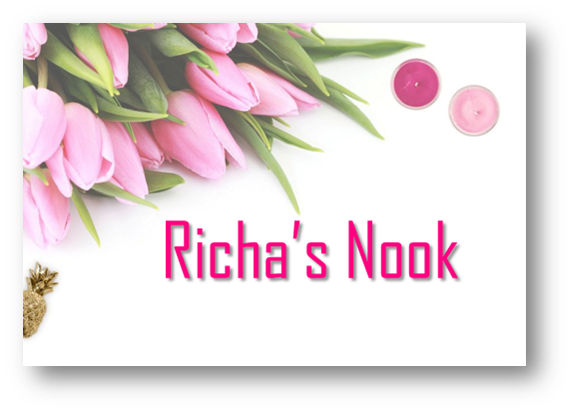 The top half will hold all my books and other accessories with a more elegant look. I also decided to cover the shelves themselves. Although, most of them are simply covered with newspaper (I like the effect), I have alternately covered one shelf each with the wrapping papers too; but switched them up. 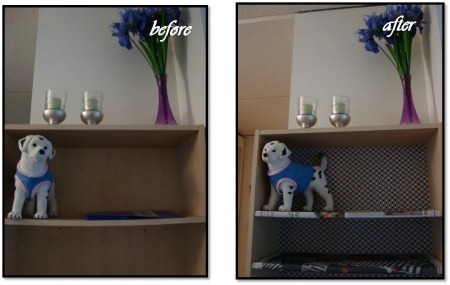 So the colorful shelf goes with the sober background and the sober shelf with the colorful backdrop. Do you think that looks good? I want to paint/draw/write something on the one side of the bookcase that is visible to all, but I have not been able to come up with anything yet. Have any good ideas for me? 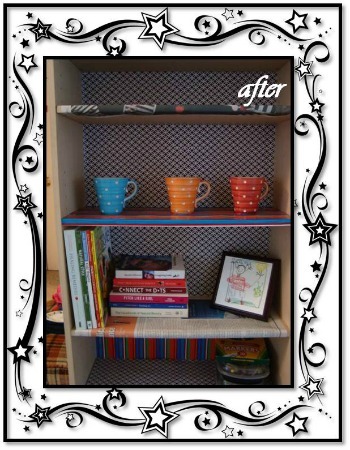 Tell me what you think of my very first diy project - the DIY Bookcase!